We branched off our Academy program in 2010 to join with the IEA to start "H-bar / IEA Academy" and have seen the program grow from just 2 students to over 100! Now we are going back to our roots and offering h-bar Academy in Pasadena. Check out our Summer Schedule! We are excited to announce a new offering of classes designed for families. Want to brush up yourself on some of those classes you took back in high school? Want to be current on the topics your child is learning at school? Email to find out more about these fun classes. Home School classes We also offer guidance and instruction for home school families who seek support, especially for science and math. We can help you select and teach an appropriate curriculum for your home school plans. If you have a group of students that would like to learn about a particular subject, shoot us an email! 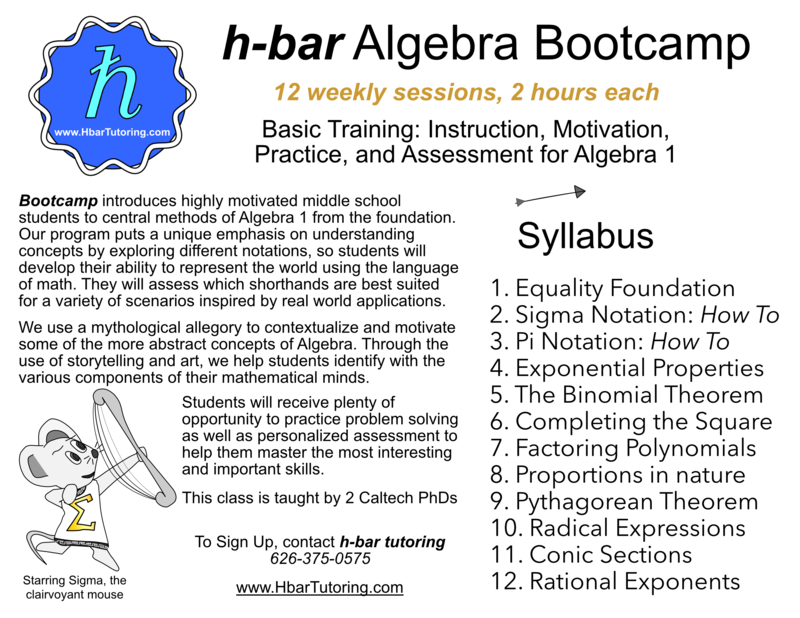 We are currently running a homeschool class Algebra Bootcamp. Find out more about this offering! Our focus is to spread science and math knowledge effectively. Several of tutors have been teaching science for over 7 years! We would love to help you train teachers in your academic setting. Reach out to us for help! We’ll ask you to describe your child’s personality as best you can. Of course we’d like to know your child’s strengths and weaknesses, and their curricular and extra-curricular commitments. Then we’ll pair your child with the best-suited tutor that we have. Our tutor will work with your schedule and will meet your child when and where it’s most convenient. Our test preparation abilities are reflected in our own successes. We know the strategies and tricks to cracking the SAT, and we’ll pass those along to your student through our preparation program. We tutor for the ISEE, PSAT, SAT I, SAT II Subject Tests, ACT, MCAT, GRE and GRE Subject Tests! Email to ask for a tutor today! Unlike other agencies, we specialize in math and science, the hardest fields for which to find good tutors! We will tutor any subject at any grade level (through college), just email today to check tutor availability in your area of need. Hbar is happy to connect a student with an experienced mentor/scientist in the field the student is particularly interested in. A mentor can help guide the student's interest and questions through discussions and activities. Mentoring is also a good way to further the mentee's knowledge about the topics they are curious about! (including SAT/ACT, and admissions mentoring): $80 / hr. College (including AP): $90 / hr. -Four students or more: Inquire! Email hbartutoring@gmail.com or call (626) 375 - 0575 to learn more.